The Ice Avenue Lofts building was originally an ice manufacturing/storage warehouse constructed in the 1870’s. The heavy timber and brick building had been neglected and was in disrepair when the developer and The Architectural Group started plans for rehabilitating the structure. Consisting of a 6,600 SF footprint, the Ice Avenue Lofts comprise four stories of condominiums with parking in the basement. The design intent was to provide five condominiums per floor with the option of combining units to expand living areas if tenant need arose. Plumbing walls and common walls were placed in an effort not to disturb existing tenants while future construction occurred. A passenger elevator was installed to access all floors, and a ramp to the basement was added to facilitate parking. The Lofts range from 800 SF 1-bedroom units to 2,500 SF 2-bedroom units. 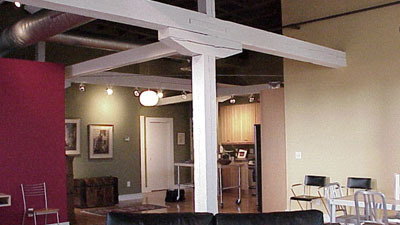 The majority of the structural columns were left exposed with ceiling heights ranging from 10’ to 14’. Most of the units’ interiors reflect a contemporary motif that complements the exposed heavy timbers, beams, joists and original masonry exterior walls. Tenants represent a diverse population of 20-something singles to 50-something empty nesters and retirees, all having similar goals of downtown loft living close to RiverScape activities and the Dayton Dragons ball stadium.